It seemed to happen overnight. From hot, stultifying, nothing moving, enervating afternoons of direct sunlight, to a damp smell of wet earth, and the smallest hint of chill in the air. Fresher breezes, cooler evenings, and is it true? Can it possibly be? It seemed only yesterday the kids were getting out of school, and I look up in the blue sky … and one leaf dislodges from our apple tree and makes its death spiral to land on my foot. Yep. It’s beginning to look like fall. And while so many of the big trees here in Vancouver are evergreen, we have our fair share of maples, and other deciduous whose leaves are about to go through that brilliant farewell of colour, in fiery reds and brilliant yellows. Here is an interesting article about why that actually happens. This time of year also evokes the sense of things coming to fruition and ripeness, then fading. 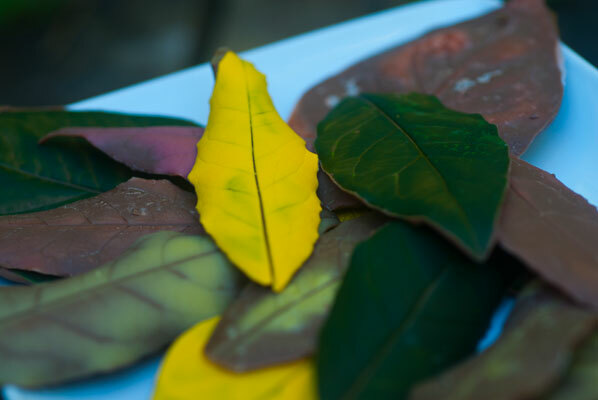 So, before the leaves of this season all fade away, I have decided to have a go with some tinted cocoa butter and chocolate to make a windfall of yellow, red, green and brown autumn leaves. I need non-poisonous leaves for this project, so I carefully make my way around the garden, scissors and basket in hand, accompanied by Younger Son. He is an able but cheeky helper, who is quick to remind me of my last ill-fated attempt at gardening (where I energetically “weeded” all of my partner’s carefully planted woolly thyme from between the paving stones). 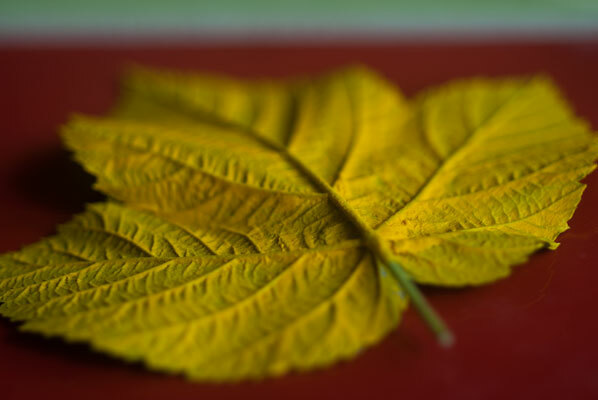 I look for leaves substantial enough to stand up to being painted with chocolate without folding over on themselves. I also look for leaves with good thick vein patterns which will read well when the leaf is pulled away from the chocolate. I want leaves which are whole, without “bug holes” or tears. 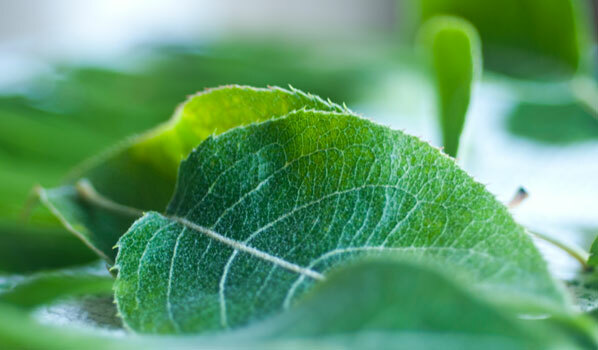 We use no chemical sprays or poisons in the garden at all, so there is no worry about any of that on the leaves. I have also selected leaves high up on their branches, so there is no possibility that they have been peed on by even the most energetic feline or canine. 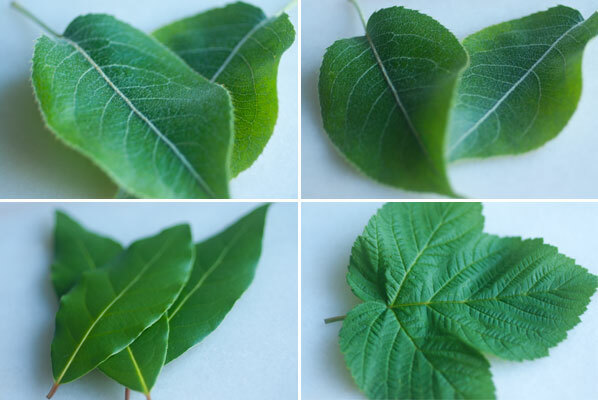 I manage a good assortment, and although we have no maples, am pleased to get a couple of biggish raspberry leaves whose outline resembles a maple. I double-check with my favorite local horticultural expert and dear friend, Ingrid. She assures me that my selection: raspberry, strawberry, bay, apple and lilac are all non-toxic (once again: as long as they have not been sprayed). I am particularly hopeful about the look of the bay leaves: they are smooth, thick and strong with a well-defined central vein. I give them a thorough soak in the sink before gently rinsing and lining them up on a clean tea towel to drain. I press another clean tea towel on top, slide a cookie sheet underneath the whole thing, and put them on top of a cupboard to dry slowly, overnight. 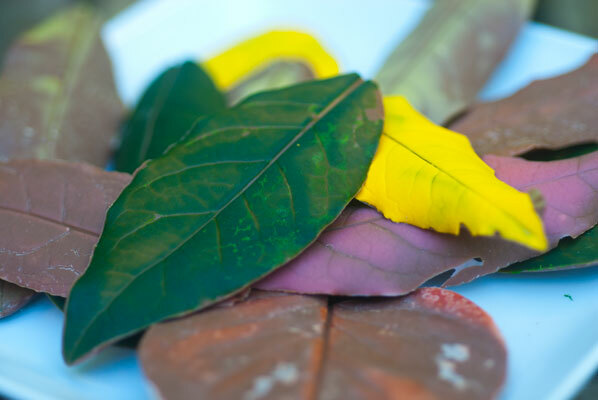 Originally, I was going to make all of these chocolate leaves brown – simply chocolate – the way I have been making them since the 1980s (sigh – I am old) but in looking out my supplies, I glance at the two bottles containing tiny amounts of professionally coloured coca butter, from Chef Rubber, graciously donated to me by another Pam, from Ecole Chocolat, when I attempted making my own transfer sheets. I also have a small block of cocoa butter and some oil based food colours. This is when I get the idea to create a palette of colour for the leaves. Once again, I am delving into “I don’t really know what I am doing, but it will be fun to try” territory. I had so much fun making splotchy “Kid Art” transfer sheets a few months back, I have been dying to have a go at working with cocoa butter again. Cocoa butter, just like chocolate, needs to be properly tempered to work with, but you use pretty much the same technique and temperatures as for dark chocolate, so I get out my marble slab, chop the block of cocoa butter into uniform pieces, and melt it in the microwave oven at half power to 45 degrees Celsius. I then tablier the cocoa butter to bring down to 27 degrees Celsius, then give the mass short blasts in the microwave at half power to bring it back up to 32 degrees Celsius. I then add the oil based colour to the tempered, liquid cocoa butter, and I am ready to play. While I have been doing this, I have had my crock pot set up on its lowest setting to melt the “already coloured” cocoa butter. It looks much more like paint, with dense colour throughout, making it opaque. It feels a bit like art class, and is lovely and relaxing to paint the undersides of my collection of leaves – did I mention that? 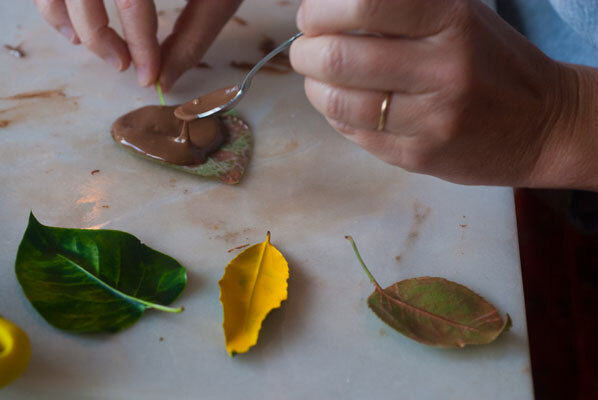 It is very important to paint the underside of the leaf, so that when you pull it off, you are revealing a pattern on the upper side of your chocolate. 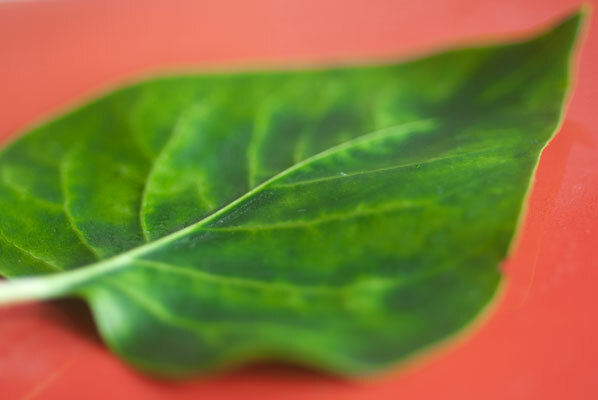 The leaves painted with my “hand tinted” cocoa butter are not nearly as vivid as the colour goes on, sort of translucent, but as they harden, the colour becomes evident. It doesn’t take long for the leaves to dry, as the colour layer is very thin, and I temper some milk chocolate for the next coat. It is very important that this coat be thick enough to add stability to the first layer, so I put this one on with a demi-tasse spoon, since I don’t have to worry about brushing chocolate into all the veins and crevices. When I made this a long time ago, I would put the leaves in the refrigerator to harden, but I don’t want to incur bloom, so I move them to a breezy corner of my bedroom, away from the shifting sun, and wait. 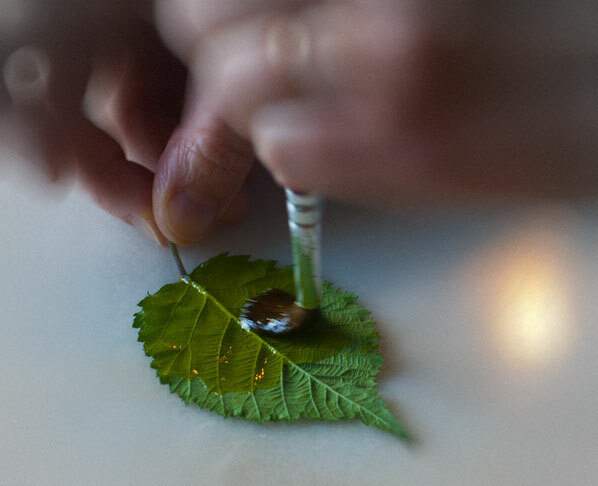 It’s kind of self-explanatory, but make sure to grasp the stem end of the leaf to peel it from the chocolate. This is where the bay leaves really show themselves off, for their sturdiness and waxy surface. They all came away with nary a trace of leaf left behind. I had to tease some miniscule bits from the raspberry and strawberry leaves, but the lilac also fared well. I was surprised to say the least, when the colours showed up so well – really nice – muted but effective in the “hand tinted”, vibrant and solid in the pre-coloured. I think these will make the perfect topping for a “Bring on the Fall” cake I am making tomorrow, for a party – a group of old friends it is my privilege to see about this time once a year (it’s the only time we are in the same city). And we are all, as Miss Jean Brody would say, “In Our Prime”. So, indeed. Bring on the abundance of the harvest and the leaves in all their brilliant grandeur for one last night out before the fall.